Worked with NASA-JPL to beta test their design of a robot modelling the Mars Rover Curiosity. Worked with the US Navy to test the design of their SeaGlide underwater glider/rover. Teachers in this program have won Ventura and Santa Barbara Engineering Teacher of the Year in 2017 from the Engineer Week Celebration at Cal State Channel Islands. The Academy of Engineering and the Robotics & Engineering Pathway empowers students to step into the role of an Engineer. The goal of the program is to introduce students to Robotics and the five major disciplines of Engineering including, Chemical, Civil, Electrical, Mechanical and Aeronautical Engineering. Students will adopt a problem-solving mindset as our courses engage the student in compelling real world projects and challenges. Our courses utilize project based learning strategies in conjunction with theoretical engineering principles. In the introductory course, students will learn electricity & electronics, use Tinkercad to design and 3D print projects and build robots. Projects include SeaGlide, an underwater glider project developed by the US Navy which utilizes an Arduino Uno. Students learn hard skills including soldering, mechanical building, Arduino programming and 3D printing. In addition, students will build and program VEX robots. Our Honors Engineering course covers the 5 major disciplines of engineering. 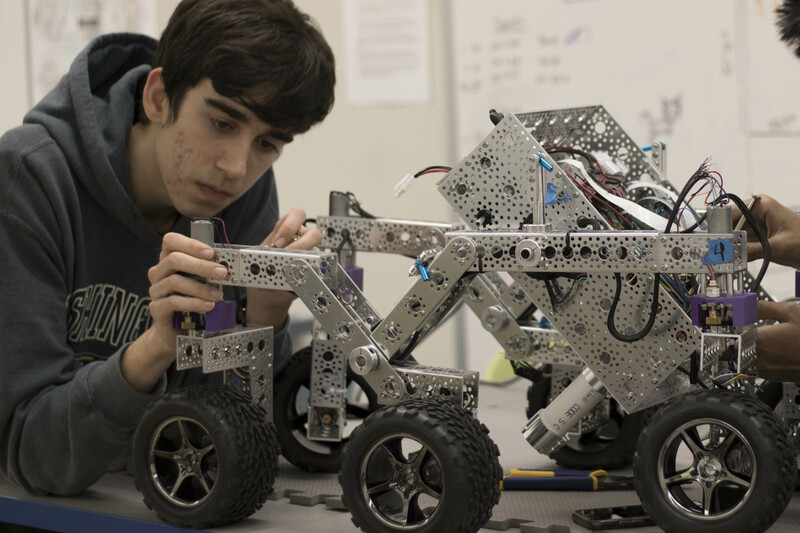 Projects include CAD utilizing Fusion 360, bridge building, and the capstone project, construction of a prototype robot of the Mars Rover Curiosity, a project developed by NASA-JPL and beta tested by Santa Susana HS Students. Our Mechatronics Lab is state of the art including soldering stations, digital Oscilloscopes, digital multimeters, power supplies, filament and resin based 3D printers. Students also work in our maker space with wood and metal bandsaws, hand tools, drill presses, metal working lathes/mills and a carbon dioxide CNC laser cutter/engraver. Engineering is a profession that contributes to change and improvements in our world. It creates imaginative and visionary solutions to the challenges of the 21st century – the problems of feeding the world, how we will use energy and continue to protect our environment. ROP Honors Engineering is designed to introduce students to the major disciplines of Engineering including Mechanical, Civil, Electrical, Chemical and Computer. Ever wondered how to design something new or draw out an idea to show your friends? Stop wondering and do it, using Autodesk Fusion 360, the industry-leading 3D design software! Discover the role of an engineer in taking an idea from the design process to manufacturing or production. Produce an incredible, working prototype of your project with state-of-the-art resin and/or filament 3D printers. Design and build 2D models and prototypes using our state of the art CO2 laser cutter/engraver. You will work on projects, activities, and problems not only of interest to you, but that have global and human impacts. Work in teams to design and improve products, document your solutions, and communicate them to others. The culmination project of this course is to understand and build a prototype robotic rover model of NASA’s Curiosity Rover. By engaging in hands-on, real-world projects, students understand how the material covered in class can be applied in their everyday lives. Ready to start the journey? This course is designed for those anticipating a career in a STEM (science, technology, engineering, and math) fields. The material covered provide a strong foundation for the SSHS Pre-med pathway and health career areas, as well as critical thinking skills for the SSHS Engineering pathway. Gene editing with CRISPR-Cas9, organism and gene cloning, evolutionary biology, translational medicine, Stem cell applications, GMO’s, and bioethics are among the key topics and themes explored in the year-long course. Must take any capstone class and complete a senior project. A minimum of 4 years of Science and a minimum 3.0 GPA in the above courses is mandatory. 30 units minimum needed to certify in Robotics and engineering.